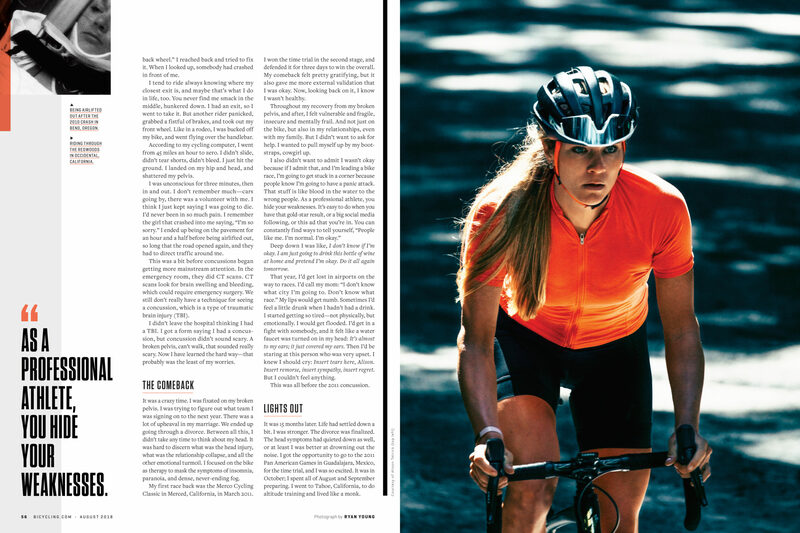 Ryan: Kristen Parker, photo editor of Bicycling Magazine and Runner’s World, reached out to me about an assignment in Petaluma, CA focused on Alison Tetrick. The direction for this was fairly loose. I was told that this story would be a full feature and potentially a cover. She referenced a few personal projects on my site and said she wanted me to shoot in a documentary style focusing on portraits, real moments, landscapes, and any other details that I was drawn to. She was very clear that she didn’t want anything set up and or overly lit. Runner’s World and Bicycling Magazine have recently undergone a pretty dramatic change in their visual direction they’re looking for authenticity and are embracing real athletes, grit, and sweat. After the call with Kristen, I came away feeling very excited. There was no shot list or anything specific to execute. It was truly a dream opportunity. Did you have a full draft of the article prior to shooting? 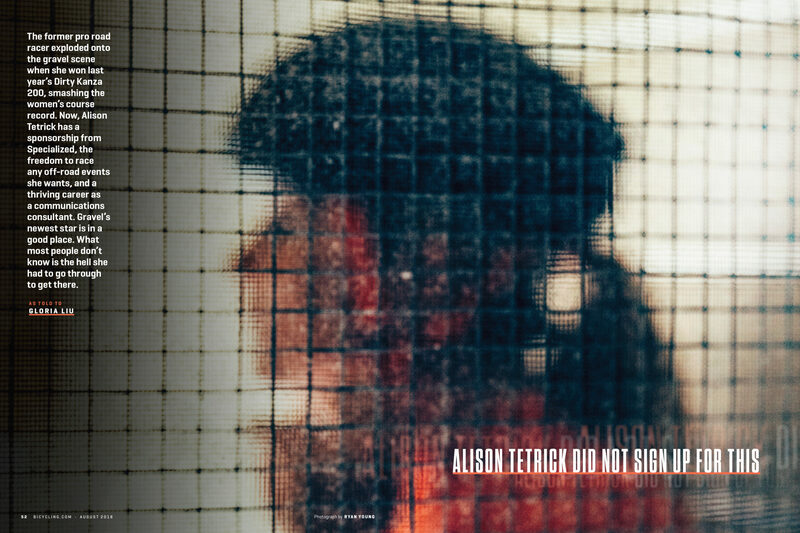 Fortunately, I was sent quite a bit of information on Alison prior to the shoot. Kristen sent me a rough draft of the story they had written which covered everything from her introduction into cycling to her comeback after a pair of horrible head injuries. Researching and learning about a subject before a shoot is just as important as charging camera batteries. When shooting an athlete I like to have a full understanding of where they’re at in their careers and life in general. Are they injured? Are they training? What’re they working towards? Were you aware of her Dirty Kanza gravel win that put her on the map in this sport? Honestly, I wasn’t aware prior to reading the rough draft and doing further research an Alison. I like to ride occasionally, but I’m a bit of a noob when it comes to the world of cycling. I loved that part of her story though! Tell us about the spread image. Given everything Alison had been through mentally and physically with the bike crashes and the traumatic brain injuries, I wanted to create images that expressed uncertainty and isolation. I wanted to play with focus and obscure a few portraits at some point in the shoot. As we were leaving her house she leaned up against a wall on her back porch and had a quiet moment to herself. I asked her to hang tight in the same pose so I could take a few photos through a screen door. I was excited to receive the final image order and have that as one of the selects. It felt very appropriate for the story. Did you plan out that cover shot or was that pulled from the edit? The cover shot was pulled from the edit. On our call, Kristen specified: “Don’t shoot for the cover.” I typically like to shoot as many options as possible within the given timeframe. For this assignment, I was blessed with 6 hours with Alison. I shot everything from wide environmental to tighter portraits and had more than enough to work with by the end of the day. Once I had a few options I felt could work for a cover, I began experimenting more with focus and shutter speed. It was very liberating to go out and react to a new subject and location without having to obsess over a specific execution. That’s pretty rare, especially for a cover shoot. How did the shoot day unfold? This shoot was a true collaboration between Alison and I. Prior to the ride, we had a phone call and went over different routes, aiming for what we felt would give us the most visual range. Alison suggested a route that offered us rolling hills, tall redwoods, and a vantage point overlooking the ocean a trifecta for the location scout. As expected, she was quite the trooper and ended up spending 6 hours working with my assistant and me. How did this project inspire you? I’ve been skateboarding since I was in middle school. I’ve suffered a string of injuries ranging from head to toe. Earlier this year, I underwent shoulder surgery. It’s as much of a mental battle as it is a physical one to push yourself after getting hurt. For me, having a chance to work on a comeback story involving an athlete was a dream assignment. 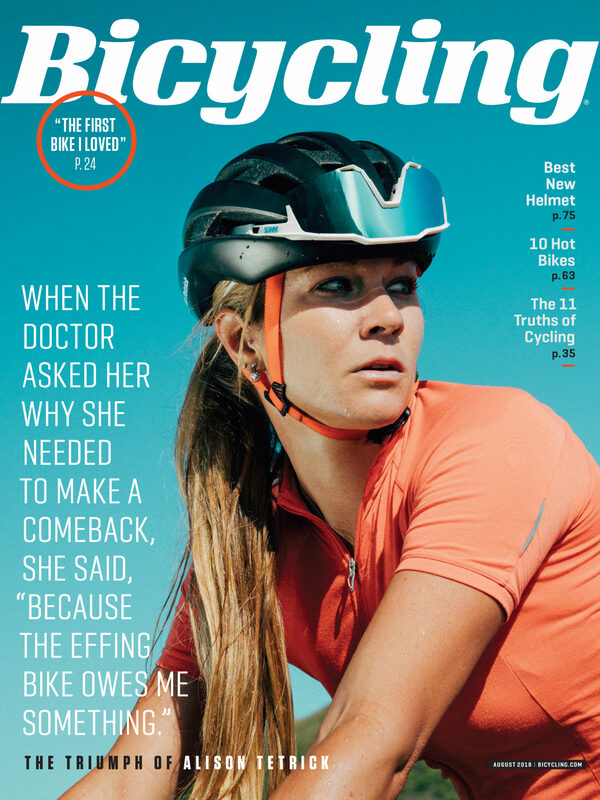 I’m constantly searching for stories like Alison’s to pitch to magazines, so being approached by Kristen and the folks at Bicycling Magazine was beyond exciting. I thoroughly enjoyed reading about her ups and downs as she battled her way back onto the bike and life in general. Beautiful images! I love the shots through the screen door.